Day 32. Good News and Bad News. Plus, $13,000 for St. Jude! Good news first: Claire and Zoe from the Ivivva store came to take some pictures of me juggling. They are so generous and gave me a whole outfit! I feel so lucky that they are so excited about Juggling for Jude! And this outfit is awesome! 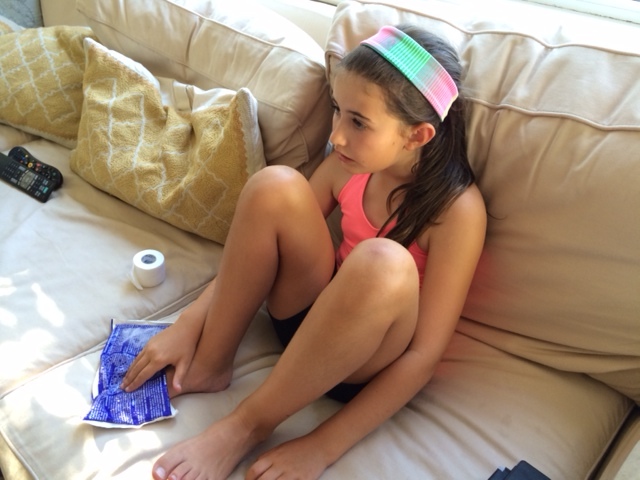 The bad news is that I hurt my foot pretty badly in dance camp yesterday. I didn’t juggle yesterday but then I pushed through dancing today, and I think it got worse. I gave it a try juggling today, but it hurt a lot. I was really upset, because I didn’t know if I should keep going or stop. My mom and I decided that I should stop. I have a dance performance on Friday, plus my soccer training starts next week! I need to take care of my foot. I’m hopeful that it will get better quickly! I will let you know. And I’m still posting my video, even though I only did 34 juggles because it hurt so much. Every juggle counts! The other good news is that thanks to so many awesome people, I’ve now raised more than $13,000! There are a few people who paid by check, so that money hasn’t recorded on my personal donation page (go here if you want to donate!!! ), but we have much more than $13,000! I am so thankful that we are going to help so many kids at St. Jude Hospital! Here’s a picture of me icing my foot. I hope it gets better, because I have a LOT of juggling to do! Days 29, 30, and 31: 146, 129, and 186 Juggles. Plus, I made it onto the Front Page of the Newspaper! It’s been a tricky few days around here, because my parents were out of town at a work event. They almost never go away, so I was a little sad and wasn’t totally my usual self. Good thing my grandparents were here to take care of me and my sister, and my grandpa took the videos of my juggling. I can’t really imagine what it’s like for the kids at St. Jude if they ever have to stay in the hospital without their parents. It must be so hard. I have some great news to report! 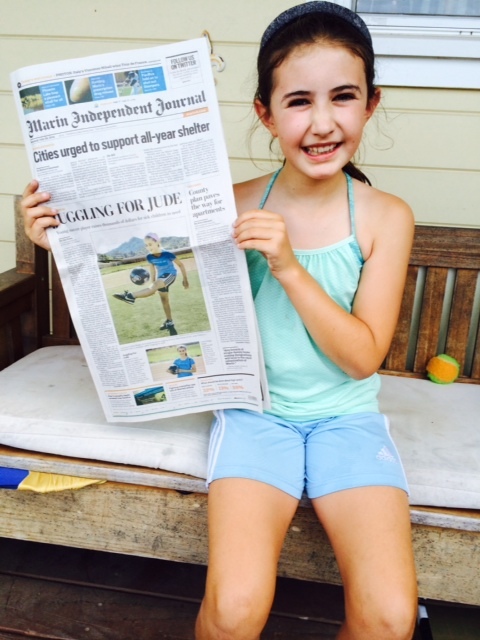 Juggling for Jude was on the front page of the Marin IJ newspaper yesterday! This will hopefully mean more donations to St. Jude for the sick kids who need my help. So far, we are at about $12,500, and I’m feeling really good about passing the $20,000 mark by the end of August. A bunch of my soccer teammates donated today, which is really nice. Please donate if you can, and don’t forget to tell your friends! Days 27 and 28: 128 and 151 Juggles. Plus An AMAZING gift from Ireland and a Reminder of why St. Jude is so Awesome! Yesterday, right before I went out to juggle, something amazing came in the mail. It was a package from a woman named Sandra, all the way from Ireland! I’ve never met Sandra, but she’s a friend of my mom’s friend, Dr. Doug, and she has been seeing all about Juggling for Jude on Facebook. Sandra sent a very generous donation to St. Jude, but she didn’t stop there. She also sent me some special chocolates from Ireland and the nicest note of support I’ve received yet. She told me at the end that I’ve “added and extra ray of sunshine” to the summer. That made me smile and made my mom cry. Thank you, Sandra! Something else came in the mail right before my juggling. It was a magazine from St. Jude telling all about the amazing things they do there for kids with cancer. There was a picture of a little baby with cancer, and I kept him in my mind as I juggled. St. Jude is doing some really great things for sick kids and their families. You should really see their website so you know just how special this hospital is. Please donate if you can. Every bit helps! Oh, and if you’re keeping track, I got 128 juggles yesterday and 151 juggles this morning at 8am before camp. I’m learning that it’s really hard to juggle after a long day in 100-degree weather, so I got out there early today! Thanks for your support, and keep thinking about the kids at St. Jude who need our help! 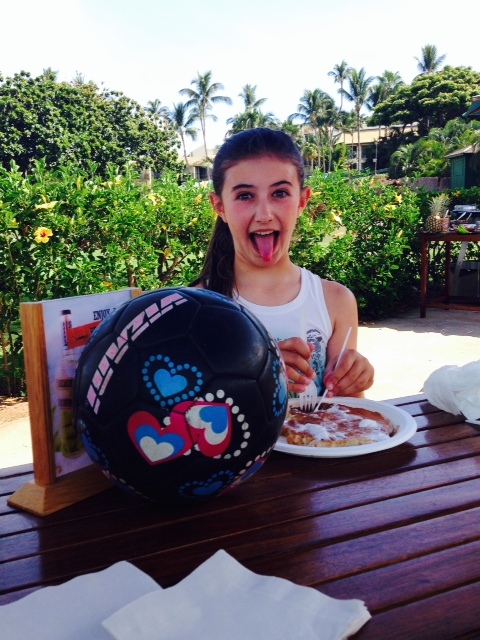 Days 25 and 26: 151 and 98 Juggles. Plus I’m Tired but Inspired! On Monday, I took the day off after my record juggle of 326 on Sunday. Yesterday I got 151 and today was only my second time under 100 since week one (I got 98). I was at camp all day then had 3 hours of dance class. Then I went out to juggle, and the winds were so gusty I had to wait till later. Plus, we all wanted to watch our amazing friend, Marcus Filly, compete in the second event at the CrossFit Games. He was AWESOME to watch! 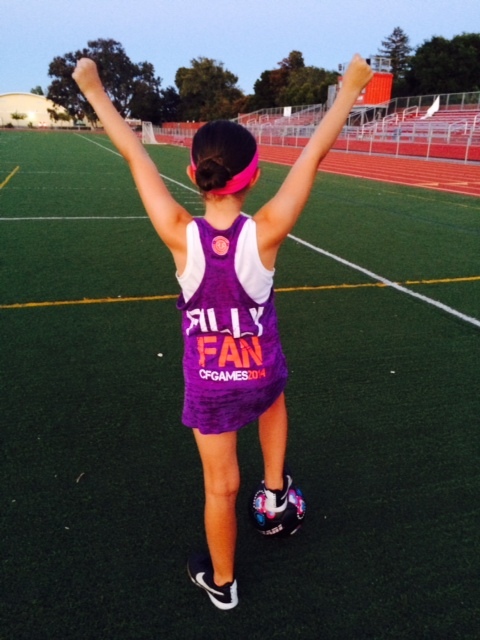 I felt so inspired, so I decided to wear my mom’s FILLY FAN shirt while I juggled. I got super hot, so I took it off, but not before my mom got this picture of me in it! I’m sending all my good thoughts to Marcus. He started the competition off with a lower finish than he wanted, but he’s already fighting back. I can relate to that, because I sometimes have to fight my frustration to get a higher juggle number. Even when I’m super tired like today. Tomorrow is another day of chances for me and Marcus, and I think we will do great! I know I’ll be cheering for him! By the way, I’m getting close to the $11,000 mark for St. Jude Hospital! This is so amazing! My new goal is $20,000 by the end of August, and I think we can do it! I’m going to keep juggling when I’m tired, because it’s the least I can do for the sick kids at St. Jude. They need my help! I GOT 326 Juggles!!!! Plus $10,000 Now in Reach! I can’t even believe it. Yesterday, my mom and I had a talk about having a positive attitude, and I secretly had a goal of getting to 220. I GOT 326!!!!!!!! A teenaged boy and his dad stopped in the middle of their football game to watch. I was SO tired after 200, and my whole body was shaking, but I kept thinking of how badly I wanted to get to 220. Then when I did, my mom just kept telling me I should keep going and I was doing great, so I did. It turned out that her phone ran out of storage so we thought it stopped recording after 300, but the YouTube video shows all 326! I told my mom people would have believed me that I got 326 even if the video did stop at 300! The absolute best part about it is that this means a WHOLE LOT MORE MONEY for the kids at St. Jude Children’s Hospital! I really hope you can donate. Even just a few dollars will make a difference to those kids. Really, just a few dollars from everyone will help! This picture shows me and Pete. We were exhausted after all of the hard work and excitement of the day! I am so thankful for all of the support of JUGGLING FOR JUDE, and we are very close to getting $10,000 for St. Jude Hospital. Maybe your donation will get us there! You can also help by telling all of your friends and family and posting on social media. We’ve gotten some great support from famous soccer players. Maybe you can be like them? 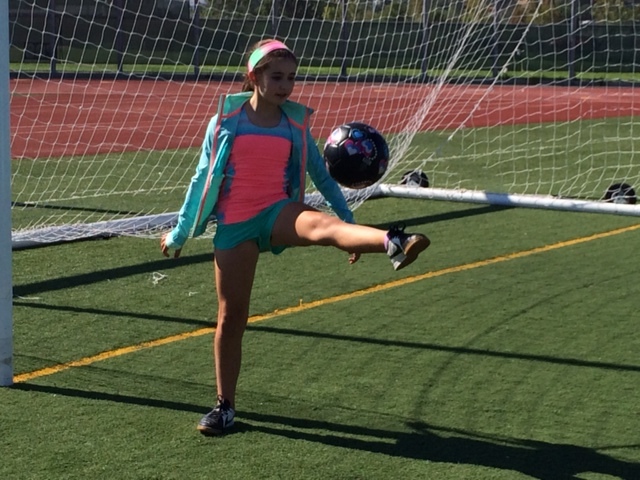 Next stop 400 juggles and $10,000 for St. Jude! PS for the record I got 104 on Day 22. And I got 101 on Day 23. Days 20 and 21: 122 and 156 Juggles for Jude! Plus my First Official Media Photo Shoot! And…We Have Passed the $9,000 Mark!!!! Guess what? We have raised over $9,000! We got some more online donations and a check today that puts us over the $9,000 mark, but it isn’t going to be recorded on my donation page until it gets to St. Jude. How exciting is that? $9,000 in less than one month, not including the pledges for my final tally! I think I might have to try for $20,000 by the end of the summer! 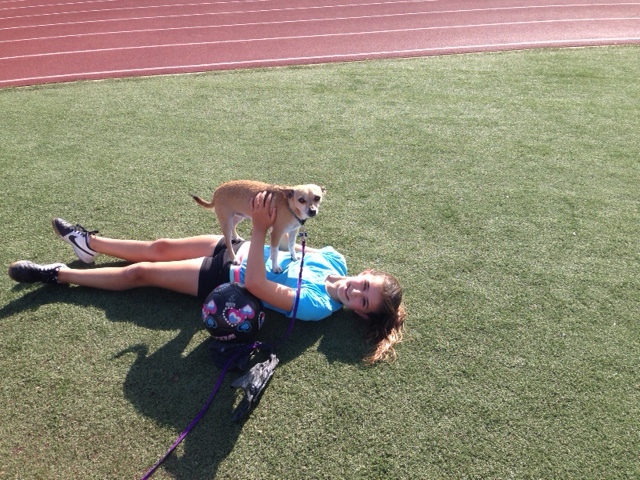 Today I went to camp and then raced out to the field for my first Juggling for Jude photo shoot! A local newspaper is doing a story on me and all of the amazing donations we’ve received for St. Jude Hospital! It was hard to juggle with a camera going the whole time, and these crazy winds haven’t stopped a bit! I didn’t really try for my real juggling, because it was just too windy. Instead, I went inside and got 156. Another obstacle got in my way like it did the other day, but I’m getting better at not letting those things get me frustrated. I keep remembering why I’m doing this–it’s not about records. It’s about helping the brave kids at St. Jude! Oh, and yesterday I got 122 and a group of really nice men playing in a pick-up game gave me a standing ovation for juggling! 🙂 It was fun! I should have a really exciting announcement in the next few days, so be sure to keep checking in on my blog and like me on Facebook. If you want to donate, you can just click the link here, or you can pledge a per-juggle amount on my Juggling for Jude Facebook Page. Remember, my daily record average is well over 100 juggles, so keep that in mind if you make a pledge! Thanks for your support and keep telling your friends about JUGGLING FOR JUDE! Days 18 and 19: 85 and 120 Juggles. Plus MORE THAN $8,000 RAISED and the Best Donation Yet! WOW! Thanks to all of you amazing people, we have raised more than $8,000 for St. Jude Hospital! That is so great, I can’t even believe it! Yesterday I was in a bit of a juggling slump and the winds have been blowing like crazy around here in the afternoons, which makes it really hard. I did what I could and got 85. It’s funny how that’s a bad day for me now. Today, I tried again after camp and it was windy again. I was starting to get frustrated, so my mom suggested that I just play with my dog and then we could go to one of our gyms and juggle there. That’s what I did. I ended up with 120–some equipment got in my way, but I’ll take the 120! Then my mom told me about a great donation that came in tonight! Two boys who are the sons of my mom’s friend found out about Juggling for Jude. After watching some of my juggling videos, Storm and Mason, ages 5 and 6, ran to their piggy banks and each took out six dollars. Together, they donated $12 to St. Jude Hospital! How great is that?! The picture below is of them. Thank you, Mason and Storm! 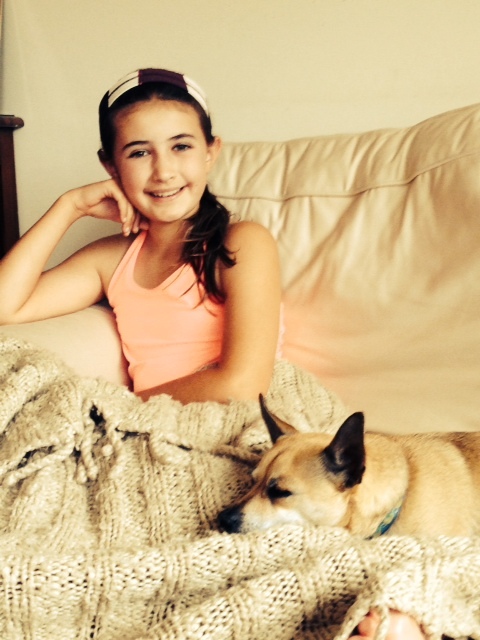 Mason and Storm have the right idea–every dollar counts and helps the kids at St. Jude. Perhaps you have a few dollars to spare, too. If so, you can donate here. Back on my Home Field for Day 17: 148 Juggles and Over $7,000 Raised. Plus an Inspiring Video About a Girl Beating Cancer at St. Jude! My vacation was so fun, and I am so lucky I got to go. But it’s also great to sleep in my own bed and juggle on my own field! I got 148 yesterday before watching the World Cup finals. I’m so excited to report that in just 3 weeks, Juggling for Jude has raised over $7,000 for St. Jude Children’s Research Hospital! I can’t wait to see how much we raise by the end of summer. Thanks so much for your support so far, and please keep helping by spreading the word to your friends and family. The more people who know, the more lives we can save! Here’s a Today Show clip from November, 2013 about a girl named Kate Foster, who was treated at St. Jude for Leukemia. It’s a 5-minute video that shows the amazing spirit of a girl just a few years older than I am who lost her leg to cancer but didn’t lose her fight to compete as a gymnast. The interview at the end of the video is with St. Jude’s National Outreach Director, Marlo Thomas, whose father started St. Jude. She tells some facts about the cures they are discovering that make me want to juggle more and more. This hospital is so incredible–I hope you can help! Please donate here or pledge a per-juggle dollar or cent amount on my Juggling for Jude Facebook page. 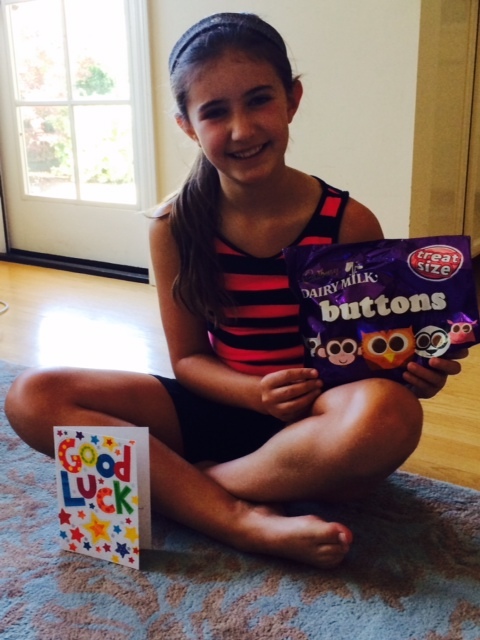 Thank you for your support and for telling your friends and family about JUGGLING FOR JUDE! More Hawaii Juggling with a New Record of 216! Plus, a Good Support Team is So Important! I got another new record today! After 117 yesterday, today I broke the 200 mark for the second time ever and got to 216!!!!! 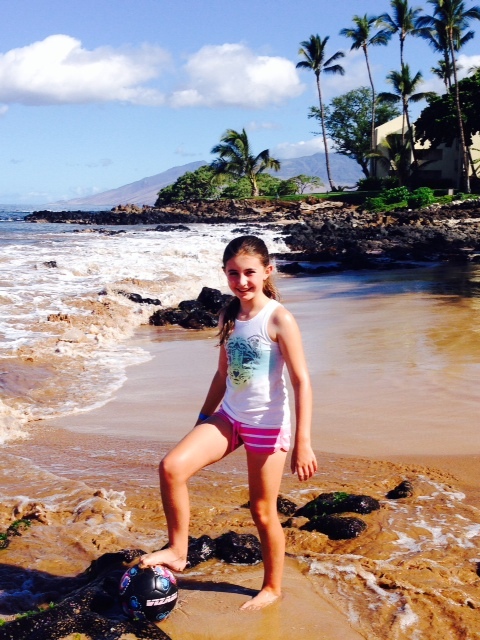 I am trying to stay focused during vacation, because each juggle will help one of the brave kids at St. Jude Hospital! One of the things that helps me most is having a good support team. Of course my parents are there watching my juggles every day, but the one who really deserves a big thank you is my sister. She is so patient when I have to juggle every morning. 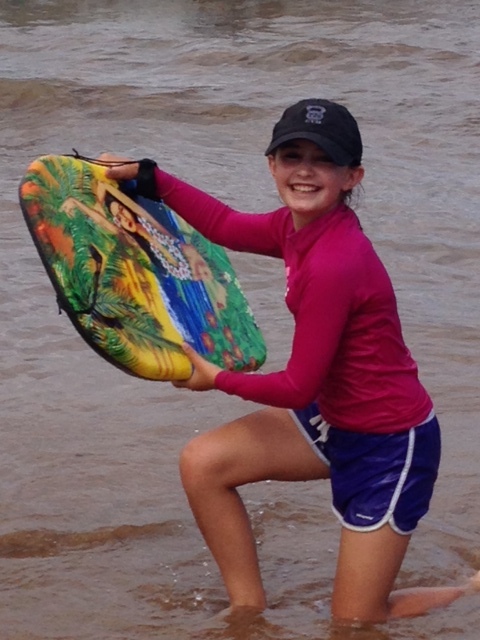 She helps count my juggles and doesn’t complain that she is dying to go to the beach, even though I know she is. 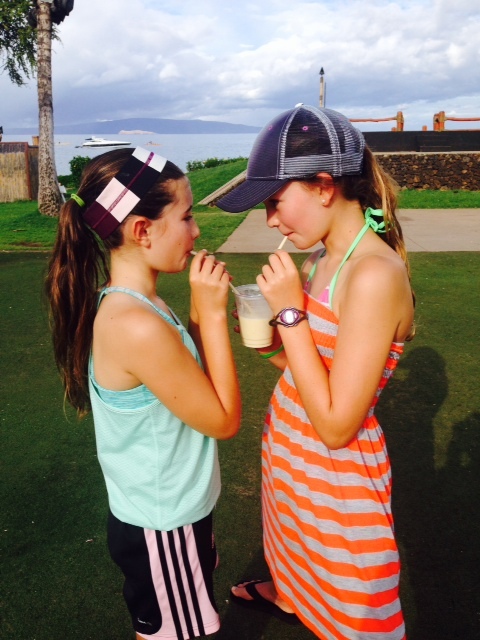 Sharing a favorite smoothie is the least I can do to thank her. We are all doing this to help kids at St. Jude. Please remember that every bit helps, even if you can’t give a lot. You can donate here or go to my Juggling for Jude Facebook page to make a pledge. I am definitely getting higher daily records than my mom thought I would, so keep that in mind if you do a pledge! 🙂 Please tell your friends about Juggling for Jude, too! They can help by donating, liking my Facebook page, and telling everyone they know!